Hi fellow quilters! We’re chatting about Abbey Lane’s new Fab Five Ruler today on the Jolly Jabber! We discovered the Fab Five Ruler at this year’s Fall Quilt Market in the Abbey Lane Quilts booth, and Kimberly challenged all of us to try it out with the free pattern that comes out with the ruler. It was really fun, fast and easy! We ended up with some really colorful pillows.Check out Kimberly’s version in the Minny Muu collection by Lecien Fabrics. Jocelyn sewed her pillow using the Gooseberry collection by Lella Boutique for Moda Fabrics. Nova wanted to create some pillows to reflect her love of nature using the Woodland Spring collection by Design by Dani for Riley Blake Fabrics. 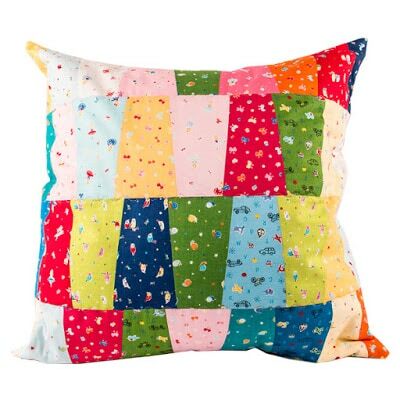 Sarah’s Fab Five Pillow is great for school trips, especially with these On the Go prints. Codi’s three Eden pillows are a must-have for any members of the #tulatroop, don’t you agree? What will you make with the Fab Five Ruler?